This may be the most common situation you encounter - talking to your Tulu speaking friend. Well now, you can talk to him in his native tongue. Here is a list of sentences you may want to use in such a case. For more sentences/phrases, you can always leave a comment asking for the same. Also, please find below audio guide for this lesson. English : Hello, how are you? English : I am fine. English : Are all well at home? Kannada : manEli ella chennagidaara? Tulu : illad maatha usaarullera? English : Everyone is fine. English : How is your work going on? Kannada : ninna kelsa hege nadeetha ide? Tulu : ninna bele encha nadattondunDu? English : What did you have for tiffin today? Kannada : ivattu tiffin ge enittu? Tulu : ini tiffin g dada ittnD? Tulu : buka daada vishaya? English : How was the coffee? Tulu : coffee encha ittnD? English : Coffee was good. Tulu : coffee eDDe ittnd. English : Where did you go on weekend? Kannada : weekend ell hogidde? Tulu : weekend oDe poditta? English : This time I had gone to Bangalore. Kannada : ee sali bengaloorige hogidde. Tulu : ee sarti bangalore poditte. English : How was your weekend? Tulu : weekend encha ittnD? English : It was superb. Tulu : mast eDDe ittnD. English : When did you come? English : I came yesterday. Kannada : naanu ninne bande. Tulu : yaan kODe battini. English : Can you wait for me? English : Ok, I will wait. Kannada : Ok, naanu kaayteeni. Tulu : Ok, yaan kaapuve. English : Can we meet today? Kannada : ivattu naavu sigoNava? Tulu : ini nama tikgana? English : We will meet today at 4'o clock. Kannada : naavu ivattu 4 gantege meet aagoNa. Tulu : nama ini 4 ganteg meet aaka. English : Can you come there? Kannada : ninage alli barlikkagatta? Tulu : nikk aDe barre aapunDa? English : Yes, I can come there. Kannada : sari, nange allige barakkagutte. Tulu : sari, enk aDe baroli. English : Is it so? English : Did't you know? English : Glad to meet you. Kannada : ninnannu noDi tumba khushiyaaytu. Tulu : ninan tood mast kusiyaanD. English : This watch is beautiful. Kannada : ee watchu tumba chennagide. Tulu : ee watch bhaari sookunDu. English : What to do now? Kannada : eega yenu maaDodu? Tulu : itte daada malpuni? English : Can we talk now? Tulu : nama itte paatergana? English : Ok, see you next time. Kannada : Ok, matte sigONa. Tulu : Ok, bukka tikga. Continuing the Learn Tulu series of posts, here are some Tulu phrases you might want to use in a restaurant and while talking to a vendor. Please find the corresponding audio guide below. Happy learning. English : What and all are there? Tulu : daada maatha undu? English : Will that take some time? Kannada : adakke tumbaa hottu aagutta? Tulu : avek jinja portu aapunDaa? English : Give me one masala dosa. Kannada : nanage ondu masale dose koDi. Tulu : enk onji masale dose korle. English : Bring it fast. Kannada : idannu bega tanni. Tulu : nEn bEka kanale. English : I dont want that. Kannada : nanage adu bEDa. Tulu : enk avu boDchi. English : I dont want that much. Kannada : nanage asTondu bEDa. Tulu : enka aat boDchi. English : Give that one. English : Give some water. English : You have given a good service! Kannada : oLLe service koTTri! Tulu : eDDe service koriyar! English : How much does this cost? English : The price is too high. Kannada : rate tumbaa jaasti aaytu. Tulu : rate mast jaasti aand. English : Please lower the cost. Kannada : rate swalpa kammi maadi. Tulu : rate onchooru kammi malpule. English : Show me the new designs. Kannada : nanage hosa designs tOrisi. Tulu : enk posa designs tOjaale. English : I will pay by cash. Kannada : naanu cash pay maadteeni. Tulu : yaan cash pay malpuve. English : Please pack all the goods, I will come soon. Kannada : ella saamaanu pack maaDidi, naaneega bartEne. Tulu : maata saamaan pack malt deele, yaan itte barpe. English : When will the ordered goods arrive? Kannada : order maaDida goods yaavaga barutte? Tulu : order maltina goods Epa barpundu? English : Yes, its been sometime now, since I had come here. Kannada : howdu, naanillige bandu swalpa hottaytu. Tulu : and, yaan iDe battd chooru portaanD. English : Whats the time now? Kannada : eega estu hottaayitu? Tulu : itte Et portaand? English : We will come again at 1 'o clock. Kannada : naavu 1 gantege matte bartEve. Tulu : enkla 1 ganteg pira barpa. Tulu is a Dravidian language, predominently spoken in Dakshina Kannada(Mangalore), Udupi districts in coastal Karnataka and Kasaragod district of Kerala. One can also notice sizeable population of Tulu people in Mumbai and Bangalore, who migrated from Coastal Karnataka in search of jobs. Here, I am starting a new series of posts on Tulu. It will be for those who want to learn Tulu. Given below are the commonly used phrases in English and its equivalent in Tulu. To read this post in Kannada you can click here. Update - 29th January 2012 : You can now listen to the audio of this post, which will surely help in getting the pronunciations right! Please click the play button below. Please make sure your browser is HTML 5 compatible. Tulu : namaskaara, encha ullar? English : Had your lunch? English : Where are you working? English : What are you doing? English : All are welcome. English : We will go to Mangalore. Kannada : naavu mangaloorige hogoNa. English : How were the rains this year? Kannada : ee sala male hegittu? Tulu : ee sarthi barsa encha ittnd? Kannada : neevu yaavaga bandri? Tulu : eer Epa battini? Tulu : yaan usaar ulle. English : Will this bus go to Udupi? Kannada : ee bussu Udupi ge hogottadeye? Tulu : ee bus Udupi g popunda? English : Where is this address located? Kannada : ee address elli barutte? Tulu : ee address olu barpundu? Kannada : sari, matte sigona. Tulu : aavu, buka tikga. English : I will come. More often we tend use or prefix 'please' in our day to day conversations. Translations for the word 'please' in Kannada and Tulu are given below. More Tulu phrases next time. Update : As per suggestion from Sandeep, I have now included equivalent Kannada phrases too. Well, it will also serve the purpose of teaching Kannada. So, it will be appropriate now, to call this series of posts, English Kannada Tulu speaking guide! 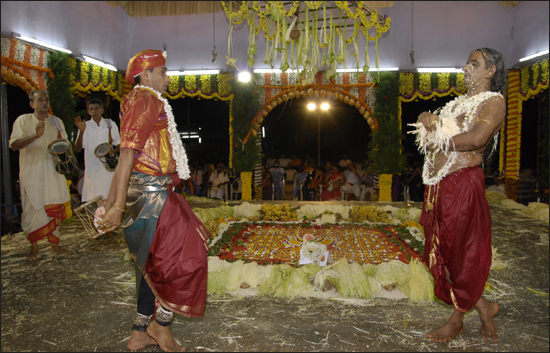 Update : 11 Feb 2012 - Adding some more Tulu phrases here and related Audio Clip! Happy learning! English : It was a lot of help! Kannada : tumba upakaara aaytu! Tulu : mast upakaar aanD! English : How it happened? English : I am happy to see you. Kannada : (sigular) ninnannu noDi tumbaa khushi aaytu. (plural) nimmannu noDi tumbaa khushi aaytu. English : Then, what is special? Kannada : matte, enu vishesha? Tulu : buka, daada vishesha? We had stayed in Coonoor the night before. So, on May 3 morning, plan was; two of us will go and park the car in Ooty. Then, those two will come back to Coonoor by bus. In case, you are wondering what is it all about, this was our arrangement to make sure that everyone in our group gets to enjoy the travel in Nilgiris Heritage train from Coonoor to Ooty. Shrinidhi and Deviprasad went to Ooty to park the car. Me, Suhas and Atheeth stayed back in Coonoor. Nilgiri Heritage train(also called Nilgiri Toy train) from Mettupalyam arrives at Coonoor at 10 30 am and departs from there at 10 40 am. Tickets for the train are issued only half an hour before the departure. Anticipating the rush for tickets, two of us stood in the queue as there was a restriction that only 4 tickets will be issued per person. There were 2 types of seats - I class and II class, priced at Rs.76 and Rs.3 per person. We had bought tickets for I class, but did not find any drastic differences between the classes - each row of I class seats had 4 seats and II class row had 5 seats. Apart from that, I class seats were little more cushioned than the other. As the train from Mettupalyam did not arrive on time, Coonoor railway station officials arranged for another small train starting from Coonoor which left at 10 45 am. Journey in the train which passes through tunnels, travels in middle of hills, was a nice experience though I would not term it as great. May be the hype around it created lot of expectations in me. In this journey, we took snaps of the landscapes of Ooty and of course, of the heritage train. I also shot several videos of the train travel, which eventually made me run out of camera batteries. Train travel was just over an hour, thus reaching the Ooty railway station at 11 50 am. Ooty Lake :We had visited the Ooty lake on Day 1 of the trip in the evening. After hearing from boating co-ordinators that we need to wait for an hour for our turn, we dropped the idea of boating there. When Heritage train was reaching Ooty, we could spot the famous lake. After purchasing some books at Higgin Bothams at Ooty Railway station, we headed towards Ooty Botanical Gardens after picking the four wheeler, we had parked in Ooty. Ooty Botanical Gardens : As it was a Sunday, entrance of famous Ooty Botanical Gardens was crowded. Ooty botanical gardens was full of trees of various heights, flowers of various colors and people from various backgrounds! Well, this makes an ideal picnic spot for family crowd. My camera batteries dried up after taking few snaps of the place. Now, only Nidhi's camera was operational. Dodda Betta : Dodda Betta is 8km from Ooty Botanical gardens. Though the vehicles reach till the peak of the hill, people also prefer to walk to reach Dodda Betta peak. When we went there, we were welcomed by the traffic jam. So, after parking the vehicle some way behind, we climbed the hill. Dodda betta peak also has asphalted roads. This was a surpise for me as I had always imagined ground at peaks of hills to remain natural. A telescope installed here, enables you to view the distant Coonoor town from here. After Dodda Betta, we are returning back to Bangalore, thinking thats the end of trip and no more places to be visited. But soon after leaving Ooty, we got down at Kamaraj Sagar dam and Shooting Medu. Realizing the difficulties in Kalhatti Ghat road, we had now chosen the Gudalur route to reach Mysore. Kamaraj Sagar Dam : Also known as Sandynallah Reservoir, this apart from being a picnic spot, is also a good place of study for enviromentalists. Shooting Medu : As suggested by its name, numerous Indian films have been shot here. Particularly, this place is ideal for song sequences. Surrounded by forests and mountains, this is a wonderful place. After that, Ford Fiesta was zooming towards Mysore. We realized after few minutes of drive that we had missed Pyakara lake, another shooting spot, seeing its board on our way. Masala Tea : When in Ooty, you would notice tea shops almost everywhere. Why not, since it is home to numerous tea factories. Also, one wonders at the variety of tea flavours provided - Masala, Chocolate, Cardamon, Lemon and the list goes on. Well, we prefered Masala tea everywhere we went and the price is also uniform - Rs.5 per cup. So, surely wet your taste buds with variety of tea flavours when you visit Ooty. Ooty Chocolates : We had received numerous requests from friends and relatives to bring Ooty home-made chocolates while leaving Bangalore. In Ooty, we had a difficult time in choosing the flavours! - Milk chocolates, Pista, Fruit and Nut - like tea flavours list goes on, here too. Once somebody in my office had brought Ooty chocolates which did not have any particular shape. But when we looked for them, they were are all in regular shape though not neatly cut - times are fast changing! Language : Conversing with the locals is never a problem in Ooty. You can talk to them in Kannada, Tamil, Malayalam, Hindi or English. People are very hospitable, indicating that they are good hosts. Eucalyptus Oil : Nilgiris are also known for production of Eucalyptus oil. You can find it being sold virtually in every shop in Ooty. Beautiful images from Ooty had filled our memory, when we were returning to Bangalore. It was around 12 15 am that night, when we reached home. Thanks nidhi for some of the photos featured here. We first wanted to cover tourist places near Coonoor and Kotagiri (they are the other 2 popular hill stations after Ooty) before exploring Ooty, as it was crowded. Coonoor is 17 km away from Ooty and the first major attraction we covered here was Dolphin's nose. Dolphin's nose : It is a view point 10km from Coonoor, which we covered on May 2nd in the morning. Though we did not find anything resembling its name, it is a great place with one half of the place offering a panoramic view of the surrounding hills and the other half filled with greenary of tea estates. Also, we could spot Catherine falls among the hills, which we were about to visit in later part of the day(though human accessible portion of the falls is different from what you see here). Lamb's Rock : On our way back to Coonoor from Dolphin's nose, we visited Lamb's rock, which is yet another view point. It is just 2 km from Dolphin's nose. It provides view of the Coimbatore plains. We could spot a river from the telescope kept there. Now, don't ask me which river it is! After a brief interval there we were heading back to Coonoor. Sim's Park : At the heart of the Coonoor town is the Sim's park, which is believed to be home to many flowering plants, pines, ferns and shrubs. Gigantic trees here, will catch your attention. Boating in the lake inside the park is a hit with the tourists. Otherwise, it is a place to just lay down in the grass and relax. After spending some time here and finishing our lunch in Coonoor, our next destination was Kotagiri. Catherine Falls : Kotagiri which is 23 km from Coonoor is a small town. We needed to go past it to reach Catherine falls. After parking your vehicle in one of the tea estates, you need walk about 1-2 kms to reach the falls. This walk is one of the best as you will be walking along the area covered with greenary, hills and trees on one side and tea estates on the other. We travelled further to reach Kodanad viewpoint in the evening. Kodanad Viewpoint : This place is a must visit for tourists. You can almost see the details of the geographical map of the region come to life. You can see the huge valley which dips down below and rises again. Also, one can see the Moyar river flowing, Karnataka Tamil Nadu state border and they say, you can also witness the point where Western and Eastern ghats meet. Kodanad View Point, Can you spot Moyar river? One can also enjoy the view of Rangaswamy peak which is conical shaped peak and is also considered sacred according Hindu legends. As we had gone in the evening, plateaus below looked misty in sight. So, to get the clear picture I would recommend to go when there is bright sun. That was end of day 2 on our Ooty trip. Part 1 of Ooty trip is here. Part 3 of Ooty trip is here. 3 day long weekend on May 1, provided us with a perfect opportunity to explore the Nilgiris. On Friday morning, we were on our way to India's popular hill station, Ooty. As we did not wish to reach our destination in a hurry, we stopped, exclaimed at various places we found interesting, allowing the Ford fiesta to breathe easy. First among these places was Nanjanagudu. After getting past royal city of Mysore, on way to Gundlupete you will find Nanjanagudu famous for its majestic Nanjundeshwara Temple. Bridge across river Kabini is what caught our attention. Well, there is not one but 3 bridges across river Kabini - two railway bridges one of which is not functional and one for motor vehicles to pass through. Railway bridge which is not used now, looks like a series archs. Information board by South Western Railway near the bridge says - "It was built by Dalvoy Devraj in 1735 with brick, sand and stone adopting ancient Gothic style. It was strong and wide enough to carry road traffic as well as metre guage trains, which started running in 1889. This ancient bridge today stands as an engineering marvel, which bears testimony to the skills of those who built it. This bridge now over 270 years old and could very well be the oldest railway bridge in the world because the first railways was built only after 1825 and there were no other known cases of ancient road bridges having been used to carry railway traffic". After Gundlupete, one enters the Bandipur forest. Nice roads in middle of the forest - it was place to take those photographs for Desktop backgrounds! Soon after crossing the Tamil Nadu border at Kakkanalla, travelling via Mudumalai forest area, we witnessed an area covered with gulmohar trees. Ground covered with Gulmohar flowers, giant trees and a stream nearby was a treat to our eyes. Not only green pastures, a barren land on backdrop of hills was also on our visited list. We happened to see the Cactus flower there! On way to Ooty at Theppakadu junction, we had the option of choosing two roads to go to Ooty - shorter one via Kalhatti Ghat road or longer one passing via Gudalur. We chose the former without knowing the obstacles ahead. Kalhatti ghat road is the one where you have to negotiate 36 hair pin turns and the drive was daunting to say the least. With it started raining, it was more difficult. After crossing ghat road, we were cruising to Udhagamandalam going past road between tall, lanky trees - scenes most shot by Indian film fraternity. First thing I could notice in Ooty was that it was very crowded place. But well, Udhagamandalam, Ootacamund, Whadacamund, Wotkymund or simply Ooty, is an exquisite place for tourists. Metaphors too fail to capture its vastness in words - Scotland of the East, Big Queen of the Nilgiris hardly suffice. More on Ooty and surrounding places in upcoming posts. Click here to read the Kannada version of this article.